Yah! I can take screencaps of movies! I don't know why I'd ever want to take screencaps of movies, and I don't think I'll probably ever do it again, but ... if I want to, I can. And that makes me cool. Wait. But the picture and the caption are not the same. Am I on crack? Or am I not seeing that right? Um, well, I was [SHAMEFUL GEEK ADMISSION] watching the movie with the cast commentary turned on [/SGA]. 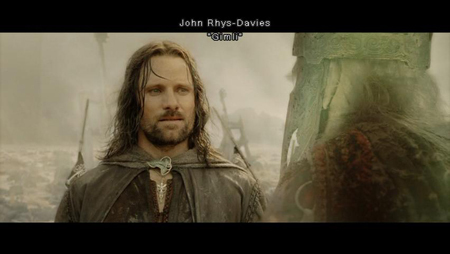 John Rhys-Davies ("Gimli") was talking at the time I took that screencap of Aragon, thus it was his name that was displayed. Ah. And that's not shameful! I watch ALL the extras. That's why I love DVDs! Sometimes I even play the games that are on there! And I asked for (and received) Mary Poppins for Christmas, specifically for the extras!